TGIF Everyone!!!! And Good Morning!! I didn't really want to be up at 8:30am but my hubby and my body didn't want me to sleep any longer(lol) so I figured I'd get up and get a move on it! hahahaha. 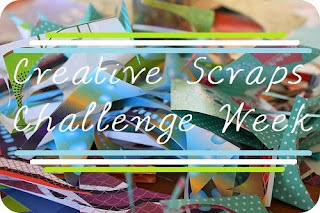 Today is my day to provide "inspiration" for our Creative Scraps Challenge Week! First---I want to thank you all who have been bouncing around from blog to blog each day to see what we're creating AND to be inspired. And for leaving comments.....comments motivate us! I also want to thank everyone who has gone over to Molly's blog and become a follower and left the sweetest comments. She really does appreciate it and it puts a smile on her face. OK Enough of that...onto my card for the day! This style was totally inspired by Momo @ Made by Momo's , who created the most adorable Christmas card with a penguin on it!! Be sure to go check her out, although I'm sure all of you found me through her so you've probably seen that naughty little penguin ;) Like I said the card style (easel) was inspired by her. The stamp set is from no other than Scrappy Mom's (if you guys haven't seen their stamps or want to order be sure to head over and check them out. Trust me, you wont be disappointed). As you know the challenge is to create a Halloween/Fall Project using Paper Dolls Dress Up--on Sunday, we'll have an added element! Just to spice things up! The only thing that is not on Paper Dolls Dress Up is the goo coming out of the pot. That is the "gooey" boarder punch by Martha Stewart. 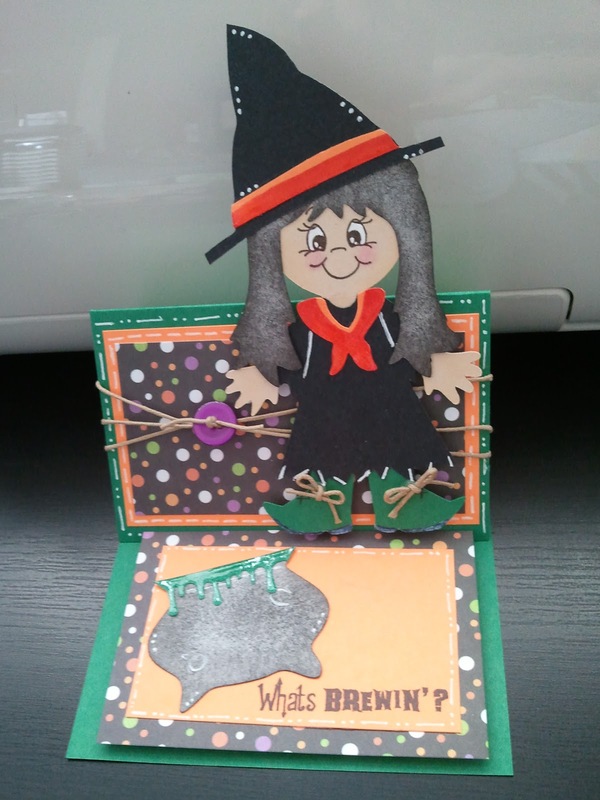 This adorable witches shoe laces are braiding cord and her face come from PK Everday Faces. 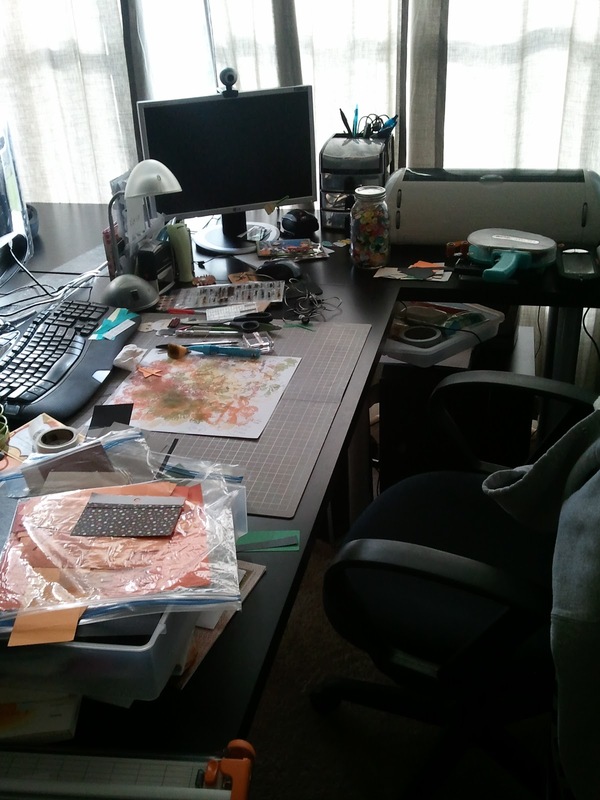 Just thought I'd show you what a mess my desk is! Momo would freak out if she saw this!!!!! Hahahah I've not only been working on challenge stuff this week but also invitations for an order on etsy....hence the huge mess! Very nice... i think its time for me to try an easel card... lets see what i can come up with today. Your card is adorable, I love it!! I so love that gooey punch was the perfect touch. I just love the look of an easle card. 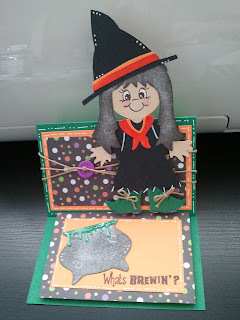 such a cute card :-) love the goo on the cauldron.